In Al Gore’s 2006 sobering documentary An Inconvenient Truth the man who “used to be the next President of the United States” relied heavily on charts, infographics and statistics to shock viewers into a collective sense of responsibility when tackling global warming. 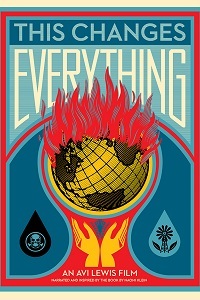 In the wake of her best-selling book of the same name, Naomi Klein – along with husband and director, Avi – eyes a similar goal in a similar field with new documentary, This Changes Everything (2015). Subtitled ‘Capitalism vs. The Climate’, the Canadian journalist changes tack completely from her political predecessor, attempting to humanise the issues by focussing on the struggles of a number of individuals and groups as micro representations of a macro problem. Forcing recognition that man is controlled by, and does not control, nature and that a change in global economics is vital to conquering climate change, she even suggests that many of the world’s ills can be cured by everyone working together in the face of this impending catastrophe. With clearly noble intentions, and in attempting to put a positive spin on dire circumstances, it is odd that Klein demonstrates such little passion for a subject that sees activists chained to excavators, sleeping in oil pipelines and prostrate in front of police lines. More a passive bystander than an active participant, her lack of enthusiasm, absence of direct address, monotone narration and general apathy make for a disappointingly aloof and perfunctory examination of extremely important material, summed up, rather ironically, by her opening gambit: “Can I be honest with you? I’ve always kind of hated films about climate change.” Steering away from images of polar bears and melting ice caps, we begin in Canada with the controversial tar sands project in northern Alberta which currently constitutes the largest industrial project in the world. A stark example of greed over conscience, the sweeping images of a devastated landscape that was once verdant forest are sickening. A young man blowing his nose with a $20 bill demonstrates the essence of Fort McMurray but the flip side of a coin dripping in oil here is the destruction of sacred First Nations lands. A member of the Beaver Lake Cree Nation attempts to inspect a possible spill only to be stonewalled by bureaucrats. Frustratingly, this thread is the first of several raised by the film where no resolution is reached; the same occurs with goat farmers in Montana and a Northern Cheyenne Indian Reservation. Seemingly wanting to paint her homeland in as poor a light as possible, Klein then highlights the proposed implementation of a Canadian-owned gold mine in Halkidiki, Greece, which would ravage the utopian lands but give a much needed economic shot in the arm to a country subsumed by debt. It is here that the convergence of capitalism vs. the climate is most acutely felt but again it feels underdeveloped by Klein’s reserved engagement with a people fighting for the future of their nation. Further excursions to Andhra Pradesh, India, and Beijing, China, complete the globe-trotting tour – which the Kleins presumably made in kerosene-spewing jumbo jets. To condense a 466-page tome into a 90 documentary was admittedly challenging, but sadly in attempting to change everything they fall short of changing anything and the end product here is not what it could, and should, have been. Where An Inconvenient Truth was a resounding uppercut, This Changes Everything fails to land a single punch. CPH:DOX runs from 5-15 November in Copenhagen. For more of our coverage, follow this link.